Bicycles are a great way to commute, exercise, and just enjoy a peaceful ride. However, cyclists also can be put in danger through no fault of their own due to heavy traffic, distracted drivers, and other dangerous conditions. Although infrastructure for cyclists is improving, there is still a risk of injury when riding a bicycle in Southeastern PA.
At The Law Office of Kamensky, Cohen & Riechelson, our personal injury attorneys help cyclists who have been injured in a bicycle accident recover compensation in Pennsylvania towns like Northeastern Philadelphia, Levittown, Feasterville, Penndel, Bensalem, Millbrook and the greater Bucks County Area. Our firm strives to show that our clients’ bicycle accidents were caused by the negligence or reckless activity of another party. If this is the case, we are often able to win full and fair compensation for our clients through successful personal injury verdicts or settlements. Call our office today in a free and confidential consultation regarding your bicycle accident, your injuries, and to learn how a personal injury claim can help secure your family’s financial future. When filing a personal injury claim, finding fault is a critical factor. Pennsylvania has shared fault laws, otherwise known as “comparative negligence”. What this means is that personal injury claims may still be filed if the injured party is found to be partially at fault. The main stipulation being that a party who is deemed to be greater than 50 percent responsible forfeits their right to seek compensation. Determining the cause of your bicycle accident plays a key part in your personal injury claim. For example, our Northeast Philadelphia attorneys may strive to show that your accident was due to poorly maintained roadways, while the insurance company may argue that it was due to cyclist error. 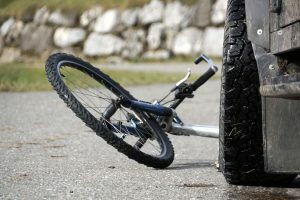 By understanding Pennsylvania bicycle and roadway laws, we should be able to build a strong case for your personal injury claim. Show cause of the accident – As mentioned above, this is the cornerstone of a strong personal injury claim. Proving the cause of accident and by extension the cause of your injuries is necessary to later show that you are entitled to compensation. Prove negligence or recklessness of other parties – After determining the cause of the accident, we will then seek to show that it was the negligent or reckless actions or inactions of another party which led to the accident. This often includes premises liability against those responsible for maintaining safe conditions and/or finding the driver of a motor vehicle responsible for unlawful driving practices. Seek financial compensation – The final step includes finding compensation for medical bills, lost wages, pain and suffering, property damage, and more. We will work with you to aggressively pursue what you and your family need and deserve. At The Law Office of Kamensky, Cohen & Riechelson, our team of bicycle accident personal injury attorneys have been serving local clients for over 45 years. We have extensive experience assisting clients in the compensation recovery process across Pennsylvania towns like Northeast Philadelphia, Levittown, Bensalem, Feasterville, Millbrook, Penndel and all of Bucks County. Contact us online or through our Bensalem offices by calling (215) 337-4915 today to speak with a member of our legal team in a free and confidential consultation regarding your bicycle accident and what we can do to best serve your individual needs.